Bandiagara Escarpment "Crossroads of Culture"
A bedded sandstone ridge that rises more than 1,000 feet above the surrounding landscape, the 125-mile-long Bandiagara Escarpment is home to the Dogon cliff dwellers, who came to the area, quite possibly from the Nile Valley, sometime in the fifteenth century A.D.
After centuries of abandonment the caves were once again inhabited, this time by the Tellem, a Subsaharan pygmy group who arrived in the escarpment area sometime in the eleventh century. Today, rock-cut dwellings of the Tellem are used as sacred ancestor shrines and burial caves by the Dogon, who, themselves live in mud-and-thatch dwellings on the lower reaches of the rock face. Nestled in the cliffs, the estimated 30 villages arebarely discernible from the surrounding rock. Four-wheel drive is mandatory once you leave the paved road in Dogon country; visiting villages entails hours of hiking in full sun. 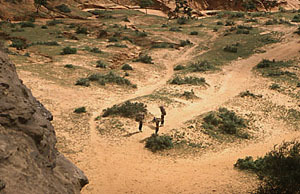 You will need a guide to both find villages and the footpaths to them and serve a as translator as few Dogon speak French. Overnight accommodations will be atop someone's roof. A better view of the heavens cannot be had. 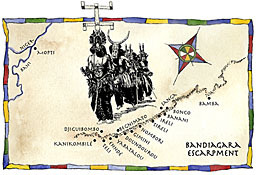 Those not wanting to camp on the escarpment may wish to stay in the town of Bandiagara, midway between Mopti and the escarpment. With individual rooms based on the dwellings excavated at Djenné-jeno, the Cheval Blanc is a real treat. 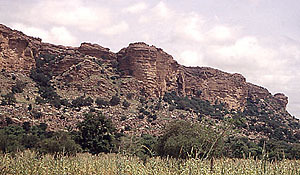 Millet, a staple of the Dogon diet is grown in the shadow of the escarpment. 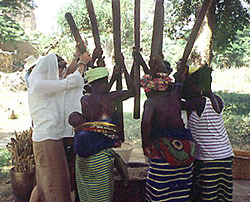 Left, author pounds millet with the ladies of Tireli Village. For those interested in Dogon mythology and all of its intricacies, the classic work on the subject is Marcel Griaule's 1948 book, Dieu d'eau (published in English as Conversations with Ogotemmêli: An Introduction to Dogon Religious Ideas). While much of Griaule's work remains current, certain aspects--notably his telling of Dogon astronomical observations, including the movements of the star Sirius--have come under fire in recent years, primarily from Walter van Beek of the University of Utrecht in the Netherlands. Van Beek is the author of the soon-to-be-released Dogon: Africa's People of the Cliffs (New York: Abrams, May 2001). 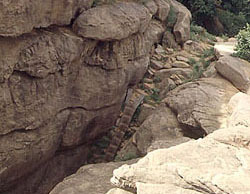 With its sheer bedded sandstone cliffs and majestic towers, including the 1,400-foot Hand of Fatima, which was first climbed in the summer of 1999, the Bandiagara Escarpment is a rockclimber's paradise.